Posted on Thu, Jan 26, 2012 : 5:55 p.m.
Judy Dow Rumelhart speaks to the Huron Players on Thursday. Huron High School's Huron Players are preparing an ambitious production for spring, the Stephen Sondheim musical "Sweeney Todd: The Demon Barber of Fleet Street." And Thursday afternoon, they got a visit from someone with some very deep ties to the show: Judy Dow Rumelhart, the local philanthropist and performer who was an associate producer of the musical's original Broadway run. Rumelhart is involved with countless local arts organizations and other charitable causes. 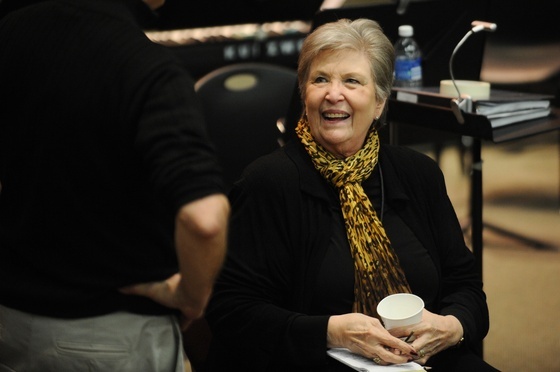 She has been honored with the University of Michigan School of Music Distinguished Alumni Award and has performed in a number of musicals. 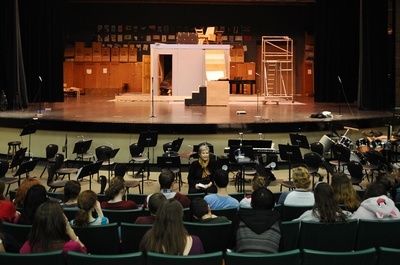 She spoke to the students about the musical, some of its characters, and her experiences as a performer. Judy Dow Rumelhart meets with students Thursday. The school edition of “Sweeney Todd," directed by Wendy Sielaff, with music direction by Dr. Richard Ingram, will be performed at Huron on Thursday-Saturday, Feb. 9-11 at 7:30 p.m.; and Sunday, Feb. 12 at 3 p.m. at Meyers Auditorium, 2727 Fuller Road. “Sweeney Todd” premiered on Broadway in 1979 and ran for 557 performances. The musical tells the story of Benjamin Barker, alias Sweeney Todd, who returns to London after 15 years' transportation on false charges. When he learns from his former landlady that his wife poisoned herself after being raped by the judge who wrongly transported him, he vows revenge. Tickets - $13 general, $10 for students/seniors, $40 for a family of four - go on sale at the door 45 minutes prior to performance, or may be ordered in advance at showtix4u.com; for more information call 734-994-2096. Thu, May 17, 2012 : 1:49 a.m.